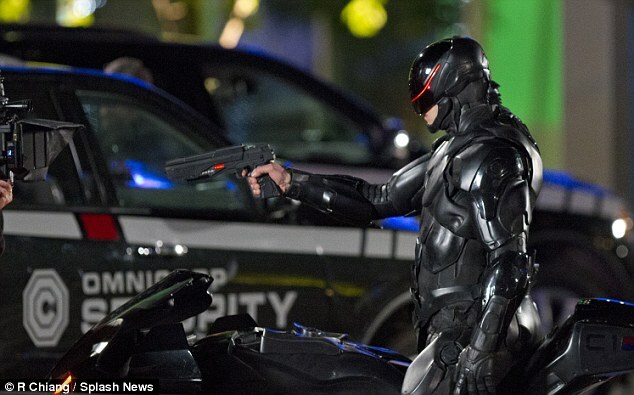 Over the past year, I’ve been writing stories on the upcoming ‘Robocop‘ remake. As I found out more and more information about this reboot of the franchise, I was becoming less and less excited about it. It might of been the fact that it was getting a PG-13 rating, the change in the suit, or many of the other differences that were popping up from the original 1987 film that starred Peter Weller. Hell, even Weller himself said he was not looking forward to the remake and even compared his 1987 film to the likes of ‘Casablanca‘, which is hilarious. I just wasn’t looking forward to this reboot, even though the cast was pretty stellar. Plus, when you walk into a remake or reboot of a film, specifically one you grew up with that has always held a special place in your heart, it’s very difficult to not make comparisons and have a big open mind to watch something different and remade. Especially, when you have the same characters, lines of dialogue, and story as the original. That being said, I was shocked on how well I enjoyed this new version of ‘Robocop‘. Director Jose Padilha (‘Elite Squad‘) has done an excellent job with this remake and has made me put this filmmaker at the top of my list to watch out for. Even though this ‘Robocop‘ is PG-13, it is unrelentingly violent and explores some plot points that the original did not, which made this a deeper film than the original. That’s not to say this doesn’t have its faults, but the good outweighs the bad here, and I’m happy to report that this rebooted ‘Robocop‘ is worth seeing. Now you might question yourself to whether or not this is going to be a good movie, even before it starts with the famous MGM logo lion that roars. Well, he doesn’t roar, but rather makes a silly sound, and you’ll think you’re gonna be in for a painful ride, but we are suddenly introduced to Samuel L. Jackson, who plays Pat Novak, a political commentator who has his own tv show and is mostly biased toward the democratic side. He explains that the American military has deployed new drones and a robot army to help with the conflicts overseas, and eventually these machines will replace human soldiers so that no more lives will be lost. Among these machines are the ED-209’s. This scene, where Novak has his film crew overseas to investigate them in action is highly intense with a good but of comedy, as we saw in the original film with their interrupted tv programs and commercials. Jackson pops up from time to time on his tv show to further the advancement that the American people need to get on board with these robots wiping out crime not only overseas but in the states. But the American people want to connect with someone, not something, so Raymond Sellars (Michael Keaton, excellent), the CEO of OmniCorp, decides to put a human inside one of these machines. Enter Alex Murphy (Joel Kinnaman), a police detective who goes undercover to stop the big bad guys of Detroit (Sorry, Dallas is not the backdrop of Detroit this time around). Of course, Murphy suffers a tragic accident and becomes Robocop. But here is where the story takes a different path than the original. Murphy’s wife and son play a significant role in this remake, and receive quite a bit of screen-time. And of course, the studio is betting on this having a few sequels, so this is mostly a big set-up for future films. Sure Robocop dons the suit, which they, for most of the film make it a black tactical armor more than the silver bulky suit, but don’t fret it does show up. But the bad villains that were so iconic and merciless in the first film, take a backseat in this remake. This is more about Murphy struggling with being part human and part machine and the free-will that exists inside all of us, no matter how forced we are to follow the rules or programs. And Padilha does this quite effortlessly. Dr. Dennett Norton (Gary Oldman), is the leading doctor in replacing amputated limbs with robotic limbs with artificial intelligence in wounded soldiers and civilians. And he is assigned to Murphy’s case with OmniCorp. His performance is of course, excellent and we genuinely root for him, even though he does some questionable things. I have a feeling he will be playing a much bigger role in the coming sequels. But his interactions with Murphy becomes more or less a father/son relationship, and it works. The action sequences are intense and loud, especially seeing this in IMAX, which I highly recommend. The gun shots are robust and make you feel you are in the center of the action. Although, there is never one point in the film where you will really feel that Robocop is in any real danger. No matter if he is fighting off 60 robots or 60 humans with large guns and explosives, he easily takes them out with minimal damage to himself. They changed up Murphy’s partner from a female to a male with Michael K. Williams (Omar from ‘The Wire‘), who plays Jack Lewis. He is great in this role, but there isn’t the chemistry there yet, and he felt underused. Then there is the great Jackie Earle Haley (Rorschach from ‘Watchmen‘), who plays the weapons expert for OmniCorp and does not take a liking to Robocop. He taunts him during training exercises with some hilarious pieces of music and a familiar piece of dialogue. There isn’t a great showdown with Robocop and ED-209 like in the original. 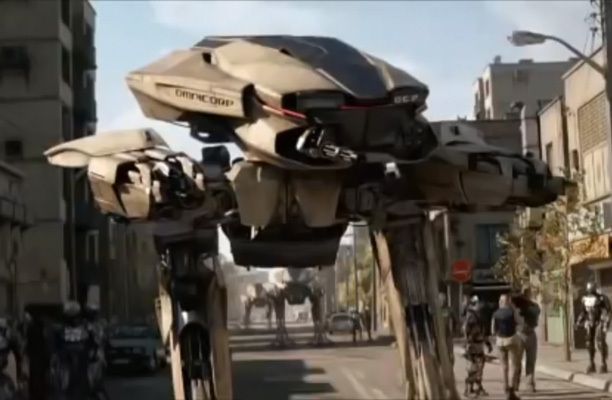 Instead, we have a scene where several ED-209’s are attacking Robocop as he flies through the air in his motorcycle. That being said, the ED’s are still very menacing and might serve as a great battle in a future film. 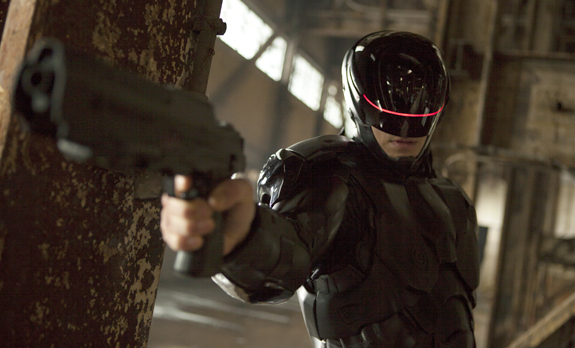 Kinnaman takes Robocop in a different direction than Weller did in the original. He has more emotion and we can relate to him more. He is a great actor and dons the suit well. 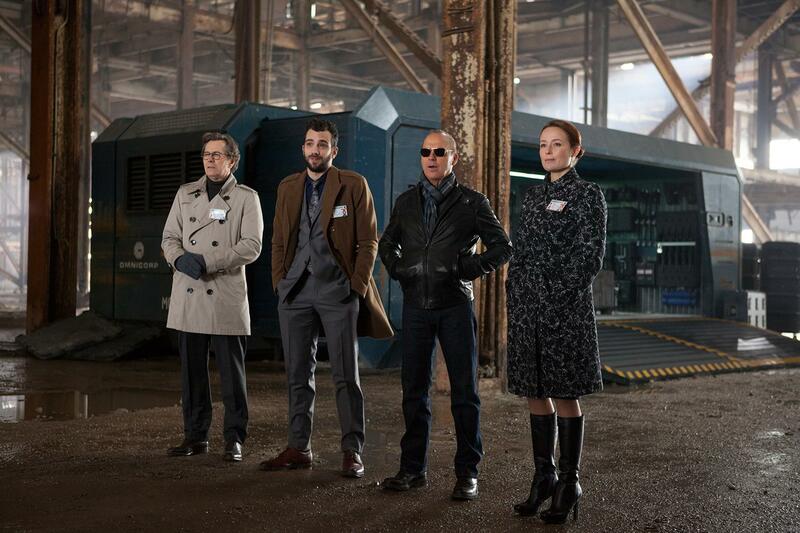 Also, Jay Baruchel (‘This is The End‘) shows up as a marketing executive for OmniCorp and provides some good laughs. Pedro Bromfman provides an okay score at bet, but he does give us that iconic score from the original, which was great to hear. If you are expecting tons of blood and guts in this film, like there was in the original, you won’t find it here. However, there are some scenes that might just be on par with the high level of gore from the first film when we see Murphy transforming into Robocop. It’s a different take, and one that is well made and thought out. It actually works better than the original here, and gives us more of a backstory and connection with our hero. This reboot of ‘Robocop‘ is worth seeing. Is it better than the original? Probably not, but it is one hell of a fine-made film, and I can’t wait to see the next one, as I imagine it will deal mostly with Robocop in the original suit on the dangerous streets of Detroit. Hell, we may even get Clarence Boddicker in the next one. Here’s hoping. This entry was posted on Tuesday, February 11th, 2014 at 1:32 pm	and is filed under Film, News. You can follow any responses to this entry through the RSS 2.0 feed. You can skip to the end and leave a response. Pinging is currently not allowed. « Film Review: ‘The Attorney’! !